True emotion trumps all! 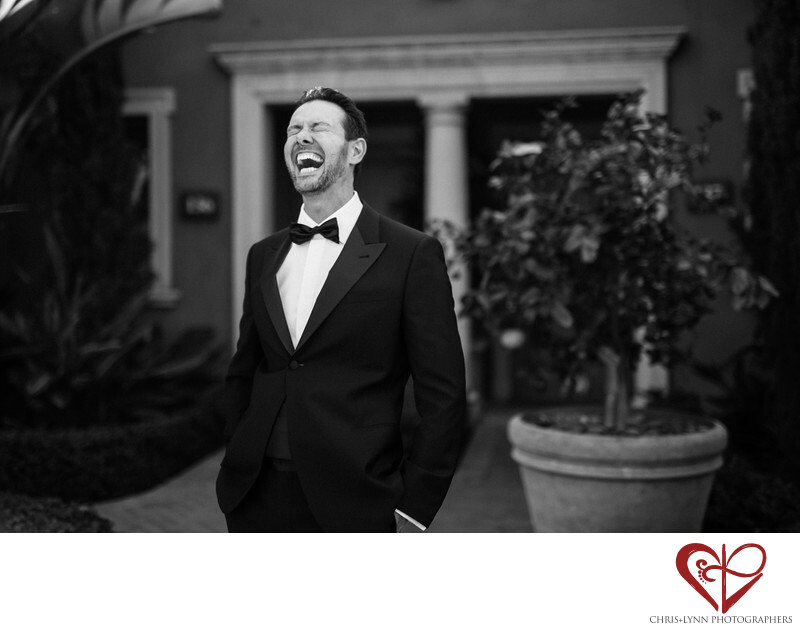 The happiness in this groom's face as he laughs in the middle of telling a story about his bride-to-be is what it's all about. As wedding photographers, we want to capture the whole range of emotions that happen throughout the wedding day - the anticipation and nervousness before the ceremony, the tender bittersweetness of the father and daughter dance, and everything in between. Couples tell us that our calm, unobtrusive, and "genuinely positive" vibe allows them to feel comfortable to be themselves and share themselves openly during their wedding photography session. The Resort at Pelican Hill is undoubtedly the top wedding venue in Orange County. Couples getting married at Pelican Hill spend an average of between $83,000 to $125,000 for a 100-person ceremony & reception. Other more affordable options in the OC include The Vintage Rose, Tustin Ranch Golf Club, Muckenthaler Mansion, Noor, seven-degrees, The Waterfront Beach Resort, The Fifth, Los Coyotes Country Club, Laguna Cliffs Marriott, Richard Nixon Library, Seven4One, The Ritz-Carlton Laguna Niguel, Franciscan Gardens, Rancho Las Lomas, The Queen Mary, Segerstrom Centre for the Arts, Balboa Bay Resort, Hyatt Regency Huntington Beach, and Pasea Hotel & Spa. Location: The Resort at Pelican Hill, 22701 S Pelican Hill Rd, Newport Coast, CA 92657, USA. 1/2500; f/1.4; ISO 400; 50.0 mm.